As many of our readers know, every advent we publish a new book of devotions for the Advent and Christmas season. This year, we are looking forward to releasing I Witness: Living Inside the Stories of Advent & Christmas, written by author and priest Kate Moorehead. 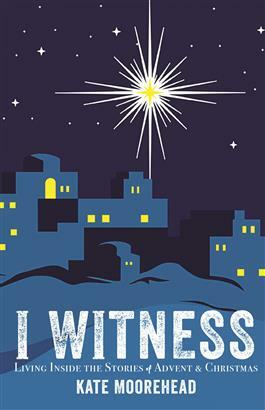 I Witness explores the story of Christ’s birth—a story many of us have heard time and time again—through the lens of different witnesses—from Mary and Joseph to the shepherds, wise men, and beyond. We had a few minutes to chat with author Kate Moorehead about her writing. I began writing after I had my first child. As a parish priest and a mom, I would drop off my son at a preschool for just three hours each day. The preschool was across from a Barnes and Noble so I found myself hiding out at Barnes and Noble on my day off once a week. It was there that I began to write. Which genre is your favorite to write? To read? I love to write theological reflections, biblical analysis, scholarly work. I also love to write the true stories of what happens in church. I am very careful to change names, ages, and genders to keep the stories confidential! Well, of course the Bible is by far the best book. But beyond that, I suppose I would have to say anything that C.S. Lewis wrote. I think that the hardest time was limiting myself to the days of Advent. The season is a short one. I could have written a lot more! I love to imagine myself within stories. This book was one great Ignatian exercise. I got to spend time living inside the characters that surrounded Jesus’ birth. It was an adventure, an exploration into a story that we have all heard. I was given the chance to take a deep dive into the heart of the birth of Jesus. There was so much to discover. Which character’s view was your favorite to write from? I loved thinking about Zechariah. In fact, I came to feel sorry for the old guy. It must have been tough to go from being a High Priest who was respected and whose voice was heard all over Jerusalem to being silent. God certainly did the miraculous work of both putting Zechariah in his place and, at the same time, giving him everything that he ever wanted. I go to books, I visit with people and listen to their stories, I watch movies, I walk outside, I pray alone, I eat dinner with my family, I snorkel, I hike. I pray and listen a lot first, but once God gives me some kind of inspiration, I am desperate to write and I write fast and furiously. I feel kind of desperate to get it all down. Footnotes and proof-reading are not my strong-suit. I am impatient to get the ideas onto the screen. Seeing the words gives me both joy and relief. I hope and pray that this little book opens their eyes to new dimensions and perspectives within this ancient story. You can learn more about I Witness and order your copy here.